My mother in law – Layla – has a beautiful vegetable garden where she grows zucchini and cherry tomatoes. Since I wanted to help her out preparing one of the meals while I was there, I decided to profit from the produce already available. During summertime, Italians prepare mostly room temperature dishes that need no heat. This is the case of the ubiquitous “insalata di riso ” or “rice salad”. This classic summer salad is usually made with thinly diced ingredients such as green peas, Gruyère cheese, pickles, olives, hot dogs (or frankfurters), tomatoes, red peppers and canned tuna packed in oil. Due to the lack of some of the above mentioned ingredients, I decided to make my own “insalata di riso”. This recipe is meatless and has one main ingredient – lemon. While lemon juice is used for marinating zucchini, lemon zest is employed to add fragrance to olive oil. As a result, this rice salad has a lemony taste – a touch of freshness and tanginess that I love in salads. 1 1/2 cup cherry tomatoes cut into 4 pieces. 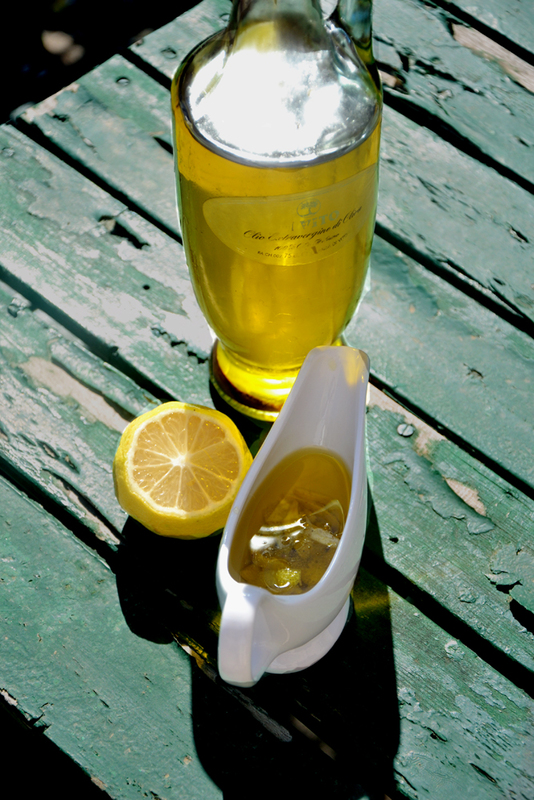 A day before, add the zest of 1 lemon to 3/4 cups of olive oil. Let it stand for about 24 hours to let the olive oil absorb the citrus flavor of lemon zest. 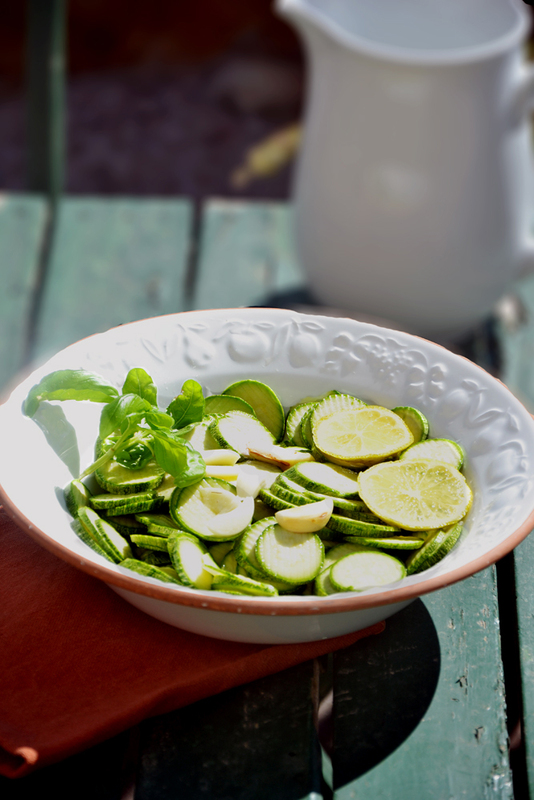 In a bowl combine sliced zucchini with the juice of 1 lemon, sliced garlic cloves, basil, and salt. Let it marinate for about 2 hours. Discard garlic. Cook rice under package instructions. Let it cool. Combine all ingredients together. Add olive oil (you can discard lemon zest if you want). Add lemon juice. Add salt and pepper to taste. Note: This salad is best if consumed the next day, when all the flavors are well amalgamated. Thank you. 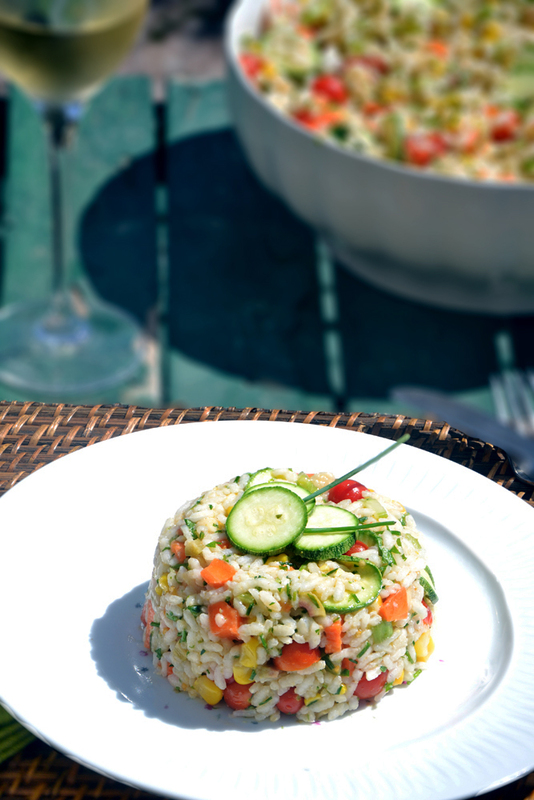 I think rice salad is a clever idea for summer meals. The advantage is that you can prepare it the day before!! I love how this is literally bursting with flavor. Cold meals like this are so great in the summer. It was cool last week, but back in the 90s now. We’re supposed to have another cool down. We’ll see. They say it is going to cool down in the weekend in Rome. Let’s hope!! Beautiful pics and delicious recipe… Here at Madrid the weather is starting to change, but it is still hot enough to enjoy dinners at the garden and this recipe is perfect for that. Thanks for sharing! You are welcome!! I love Madrid but during summer it really gets hot!! The rice salad is so beautiful. I used to make one with artichokes, peas and cucumbers but this is so much prettier. And I will use your suggestion of making it a day in advance. Thank you Karen!! A rice salad with artichokes, cucumbers and peas sounds delicious to me!!! Fabulous flavours and a wonderfully simple dish. The pictures do you credit and make me envious with their warm late summer light. Bravissimo. Merci Teacher!!! I never thought it would be so hard to take pictures like these. I am getting there….slooooowly!! This looks and sounds wonderful and the photos are great – I especially like the one of the oil and lemon and the shadows on the wooden table. Thank you!!! I am trying with the photos but it is hard!! Found my way to your blog via two clicks from Promenade Plantings’. This side dish was a stlape in our second generation NJ Italian household on Friday nights when we observed no meat’. My late mother, Eleonora, served with our fish for the week. I now make it often on its own as it’s such a comfort food full of precious childhood memories for me as well. We used to fight over the softened cloves of garlic in the large bowl of pasta!I look forward to exploring more of your wonderful blog. What a great salad, so perfect for Summer. And so well photographed! A wonderful post, an all counts. Thank you! That is so kind of you!! This is absolutely lovely! In Florida we’ve been at a steady 90 degrees too and cool, room temp dishes have been on my menu daily! I love how you presented this, so colorful. I like to infuse my oils too, the little extras just improve the flavors of food so much. I really like your style of cooking and love stopping by to see what you’re making!! That is so nice of you!!! Thanks you for your lovely comment! What a delicious sounding recipe and i love the lemon twist. The mention of olive oil being flavoured with lemon zest has inspired me. Your photos look great. I am so glad I inspired you!!! Thank you! Thank you!! It does have different textures: the crunchiness of carrots, zucchini, and almonds; and the softeness of rice, olives, and tomatoes. Thank you for all your kind compliments! Thank you! You should try it since it is easy to make and you can prepare it a day ahead! Che brava sei – gorgeous photos and wonderful recipe! I prefer my rice salad without meat or fish and this sounds so fresh and gorgeous. Delicious! Grazie mille!! I prefer the vegetarian version for fresh salads too!! Ooo! Long time no visit. I must have forgotten to subscribe to your blog. Your pics are amazing and so are the recipes! Thanks for sharing. Thank you!!!! I am glad you came back!!! this looks so delicious! must try soon!